Western blot analysis of extracts from serum starved HeLa cells, untreated (-), insulin-treated (1 μM, 30 min; +), or insulin and λ phosphatase-treated (+), using Phospho-4E-BP1 (Thr70) (D7F6I) Rabbit mAb (upper), 4E-BP1 (53H11) Rabbit mAb #9644 (middle), and β-Actin (D6A8) Rabbit mAb #8457 (lower). For western blots, incubate membrane with diluted primary antibody in 5% w/v BSA, 1X TBS, 0.1% Tween® 20 at 4°C with gentle shaking, overnight. Bovine Serum Albumin (BSA): (#9998). Primary Antibody Dilution Buffer: 1X TBST with 5% BSA; for 20 ml, add 1.0 g BSA to 20 ml 1X TBST and mix well. NOTE: Loading of prestained molecular weight markers (#13953, 5 µl/lane) to verify electrotransfer and biotinylated protein ladder (#7727, 10 µl/lane) to determine molecular weights are recommended. Prepare 1X SignalFire™ ECL Reagent (#6883) by diluting one part 2X Reagent A and one part 2X Reagent B (e.g. for 10 ml, add 5 ml Reagent A and 5 ml Reagent B). Mix well. This protocol is intended for immunoprecipitation of native proteins for analysis by western immunoblot or kinase activity utilizing Protein A magnetic separation. 20X Phosphate Buffered Saline (PBS): (#9808) To prepare 1 L of 1X PBS, add 50 ml 20X PBS to 950 ml dH2O, mix. 10X Cell Lysis Buffer: (#9803) To prepare 10 ml of 1X cell lysis buffer, add 1 ml cell lysis buffer to 9 ml dH2O, mix. NOTE: Add 1 mM PMSF (#8553) immediately prior to use. 3X SDS Sample Buffer: Blue Loading Pack (#7722) or Red Loading Pack (#7723) Prepare fresh 3X reducing loading buffer by adding 1/10 volume 30X DTT to 1 volume of 3X SDS loading buffer. Protein A Magnetic Beads: (#73778). Magnetic Separation Rack: (#7017) or (#14654). 10X Kinase Buffer (for kinase assays): (#9802) To Prepare 1 ml of 1X kinase buffer, add 100 µl 10X kinase buffer to 900 µl dH2O, mix. ATP (10 mM) (for kinase assays): (#9804) To prepare 0.5 ml of ATP (200 µM), add 10 µl ATP (10 mM) to 490 µl 1X kinase buffer. Aspirate media. Treat cells by adding fresh media containing regulator for desired time. To harvest cells under nondenaturing conditions, remove media and rinse cells once with ice-cold 1X PBS. Remove PBS and add 0.5 ml ice-cold 1X cell lysis buffer to each plate (10 cm) and incubate on ice for 5 min. Scrape cells off the plate and transfer to microcentrifuge tubes. Keep on ice. Sonicate on ice three times for 5 sec each. Microcentrifuge for 10 min at 4°C, 14,000 x g and transfer the supernatant to a new tube. The supernatant is the cell lysate. If necessary, lysate can be stored at -80°C. A cell lysate pre-clearing step is highly recommended to reduce non-specific protein binding to the Protein A Magnetic beads. Pre-clear enough lysate for test samples and isotype controls. Briefly vortex the stock tube to resuspend the magnetic beads. Transfer 20 μl of bead slurry to a clean tube. Place the tube in a magnetic separation rack for 10-15 seconds. Carefully remove the buffer once the solution is clear. Add 500 μl of 1X cell lysis buffer to the magnetic bead pellet, briefly vortex to wash the beads. Place tube back in magnetic separation rack. Remove buffer once solution is clear. Repeat washing step once more. Add 200 μl cell lysate to 20 μl of pre-washed magnetic beads. IMPORTANT: The optimal lysate concentration will depend on the expression level of the protein of interest. A starting concentration between 250 μg/ml-1.0 mg/ml is recommended. Incubate with rotation for 20 minutes at room temperature. Separate the beads from the lysate using a magnetic separation rack, transfer the pre-cleared lysate to a clean tube, and discard the magnetic bead pellet. Add primary antibody (at the appropriate dilution as recommended in the product datasheet) to 200 µl cell lysate. Incubate with rotation overnight at 4°C. to form the immunocomplex. Pre-wash magnetic beads (see Cell Lysate Pre-Clearing section, steps 1 and 2). Transfer the lysate and antibody (immunocomplex) solution to the tube containing the pre-washed magnetic bead pellet. Incubate with rotation for 20 min at room temperature. Pellet beads using magnetic separation rack. Wash pellets five times with 500 μl of 1X cell lysis buffer. Keep on ice between washes. Proceed to analyze by western immunoblotting or kinase activity (section D). Proceed to one of the following specific set of steps. Resuspend the pellet with 20-40 µl 3X SDS sample buffer, briefly vortex to mix, and briefly microcentrifuge to pellet the sample. Heat the sample to 95-100°C for 5 min. Pellet beads using magnetic separation rack. Transfer the supernatant to a new tube. The supernatant is the sample. Analyze sample by western blot (see Western Immunoblotting Protocol). NOTE: To minimize masking caused by denatured IgG heavy chains (~50 kDa), we recommend using Mouse Anti-Rabbit IgG (Light-Chain Specific) (D4W3E) mAb (#45262) or Mouse Anti-Rabbit IgG (Conformation Specific) (L27A9) mAb (#3678) (or HRP conjugate #5127). To minimize masking caused by denatured IgG light chains (~25 kDa), we recommend using Mouse Anti-Rabbit IgG (Conformation Specific) (L27A9) mAb (#3678) (or HRP conjugate #5127). Wash pellet twice with 500 µl 1X kinase buffer. Keep on ice. Suspend pellet in 40 µl 1X kinase buffer supplemented with 200 µM ATP and appropriate substrate. Incubate for 30 min at 30°C. Terminate reaction with 20 µl 3X SDS sample buffer. Vortex, then microcentrifuge for 30 sec. Transfer supernatant containing phosphorylated substrate to another tube. Heat the sample to 95-100°C for 2-5 min and microcentrifuge for 1 min at 14,000 x g.
Load the sample (15-30 µl) on SDS-PAGE gel. 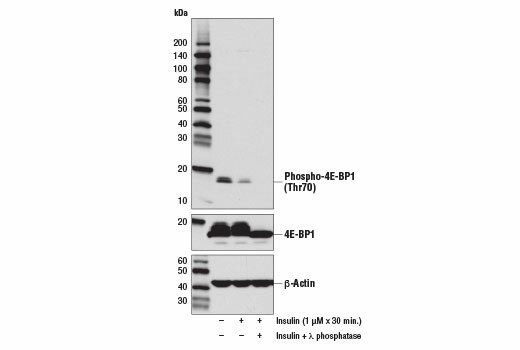 Phospho-4E-BP1 (Thr70) (D7F6I) Rabbit mAb recognizes endogenous levels of 4E-BP1 protein only when phosphorylated at Ser70. Monoclonal antibody is produced by immunizing animals with a synthetic phosphopeptide corresponding to residues surrounding Thr70 of human 4E-BP1 protein. Translation repressor protein 4E-BP1 (also known as PHAS-1) inhibits cap-dependent translation by binding to the translation initiation factor eIF4E. Hyperphosphorylation of 4E-BP1 disrupts this interaction and results in activation of cap-dependent translation (1). Both the PI3 kinase/Akt pathway and FRAP/mTOR kinase regulate 4E-BP1 activity (2,3). Multiple 4E-BP1 residues are phosphorylated in vivo (4). While phosphorylation by FRAP/mTOR at Thr37 and Thr46 does not prevent the binding of 4E-BP1 to eIF4E, it is thought to prime 4E-BP1 for subsequent phosphorylation at Ser65 and Thr70 (5). Pause, A. et al. (1994) Nature 371, 762-7. Brunn, G.J. et al. (1997) Science 277, 99-101. Gingras, A.C. et al. (1998) Genes Dev 12, 502-13. Fadden, P. et al. (1997) J Biol Chem 272, 10240-7. Gingras, A.C. et al. (1999) Genes Dev 13, 1422-37.